(Newser) – A Virginia man who spent a decade in prison after pleading guilty to a New York City slaying over 50 years ago was cleared of the crime Monday, the AP reports. 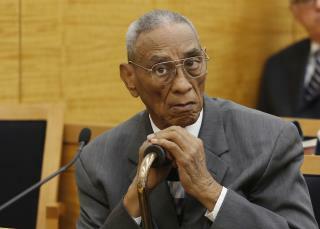 At the request of a prosecutor, a judge vacated the conviction of 81-year-old Paul Gatling for the 1963 shooting death of Lawrence Rothbort. In doing so, the judge apologized and Gatling hugged his crying ex-wife and a friend. The prosecutor asked that the conviction be vacated after Gatling, a retired landscaper, asked the prosecutor's Conviction Review Unit to look into his case. "Paul Gatling repeatedly proclaimed his innocence even as he faced the death penalty back in the 60s," Brooklyn District Attorney Ken Thompson says. "He was pressured to plead guilty and, sadly, did not receive a fair trial." I know being a detective is a hard job, but it seems that for over 100 years, cops, detectives and the DA's Office just grab the nearest guy and convict. As bad as convicting an innocent man is, don't forget the real criminal goes free. He should be grateful, he has had 10 years living at the State`s expense. Cleared is a very weak word for Completely Innocent.. Maybe there is a difference?? This will be LARGLY misinterpreted..